I was scouting books at Big Lots amidst the “remaindered” baby toys, oddball pet items, nearly expired foodstuffs, and 1980s style furnishings. My wife Nicole had dragged me into the giant discount store and I was going to make the best of it. However, one can only look at so many stacks of Jimmy Carter’s Poems or the 2003 NASCAR guide. The promised fifteen minute stop had turned into thirty with no wife in sight. I sighed and shuffled more of the haphazard book stacks. A colorful cover with an Indian illustration by Karl Bodmer awakened me from my holiday shopping stupor. The book by Robert Moore was titled American Indians: The Art and Travels of Charles Bird King, George Catlin and Karl Bodmer. The work focused on these three famous artists and explorers who painted scenes in situ of the American Indian from the 1820s-1840s. 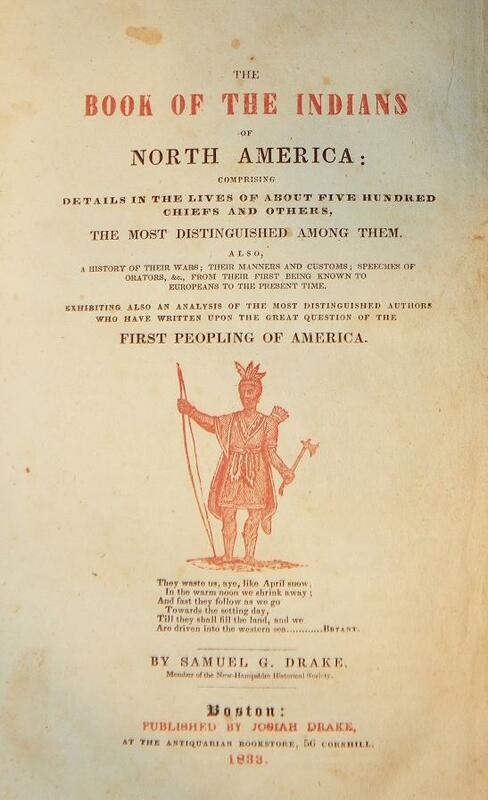 This got me thinking about a recent acquisition—a rare 1845 auction catalogue by Samuel G. Drake, the first American to collect printed material on Native Americans on a large scale. My wife interrupted my thoughts and said she was ready to go. What are you thinking about? she asked, seeing me oblivious to all. The Indian book, needless to say, came home with me. 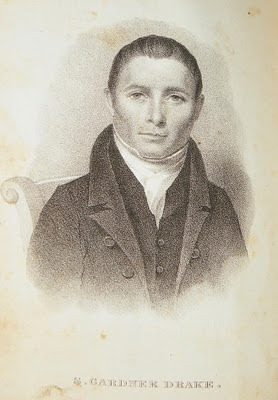 Samuel Gardner Drake (1798-1875), born in New Hampshire, began his career as a teacher. Fortunately for us, he didn’t take to teaching, but his love of reading and books blossomed. He also collected and had a knack for scouting. From the start, he not only bought and sold but published. His first publication was an edited reprint of Church’s Entertaining History of King Phillip’s War (1825). This popular work went into numerous editions and Drake’s interest in the Indians continued to deepen. His research and collecting ran parallel to the work of the great Indian artists of the time mentioned above. For Drake, much of the Indian material he collected was contemporary news—information so fresh in the minds of Americans that it had not yet fermented into history. In 1830, Drake followed his passion and opened in Boston the first antiquarian bookstore in the United States. It was well received and became a bestseller for its time, published in numerous expanded editions. My copy of the first edition above is in the rare original muslin binding. I also have an interesting copy of the 1833 second edition that contains three times the information of the first. 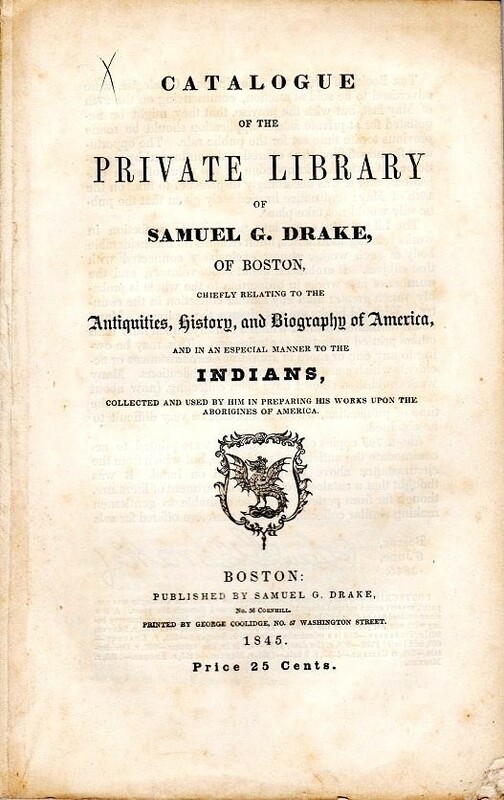 Between 1832 and 1845 Drake would publish a dozen works on Native American culture. Second edition, 1833, newly titled and greatly expanded. This copy owned by Albert W. Starbuck while aboard the whaleship Hobomok with a possible Herman Melville connection. Before the sale commenced, Drake sold the entire collection to client George Brinley, the budding collector who would go on to form one of the most exceptional Americana collections of the 19th century. 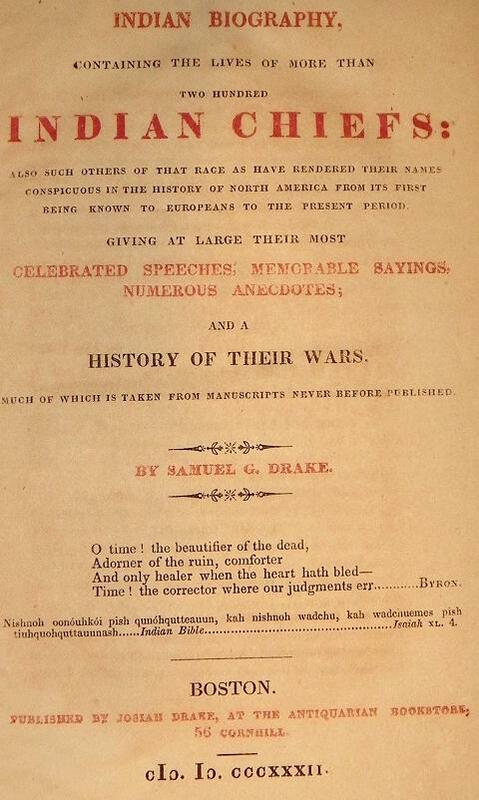 The Drake auction catalogue of “about 700 copies” was instead sold as a reference. Whether all copies were distributed is unknown but the work is very scarce in commerce. I have seen only two copies offered in twenty years and own both of them. 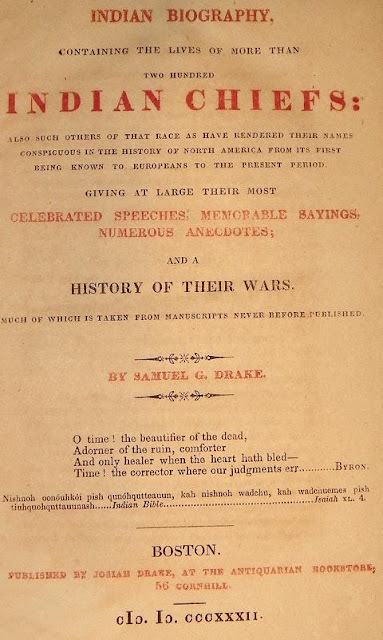 Samuel Drake’s reputation as a bookman and antiquarian continued to grow unabated until his death in 1875 of pneumonia contracted at a book auction (!). Drake founded the New England Historical and Genealogical Society and numbered among his friends and customers Edward Everitt, George Bancroft, William H. Prescott, Henry Stevens, James Lenox and John Carter Brown. For more information and sources about Samuel G. Drake see his entry in Dickinson’s Dictionary of American Antiquarian Bookdealers (1988). was this a recent purchase??? I would love to own a copy of this book...thank you. Sheila B. Great blog. Any chance that other subscribers can identify themselves. I'm David Klappholz, collector of material by and about A. Edward Newton, and material about the history of book collecting and (antiquarian) bookselling. In real life I'm a professor of computer science.